Here at Smart Circle we believe in giving back to our communities, whether local, national or international. If each person does their part, we can make a real difference in the community and the world. As a company, we are also committed to doing our part. In furtherance of that commitment, in January 2013, Smart Circle in connection with RGS Labs, created the FW1 Pink Promotion, through which fifty cents per specially marked can of FW1 automobile waterless wash and wax products is donated to the Breast Cancer Research Foundation. These specially marked cans are only available at certain in-person events facilitated and powered by the Smart Circle Sales Network. The numbers have been tallied and by the end of July 2015, a grand total of $5,000,000 donated to the Breast Cancer Research Foundation through the FW1 Pink Promotion. 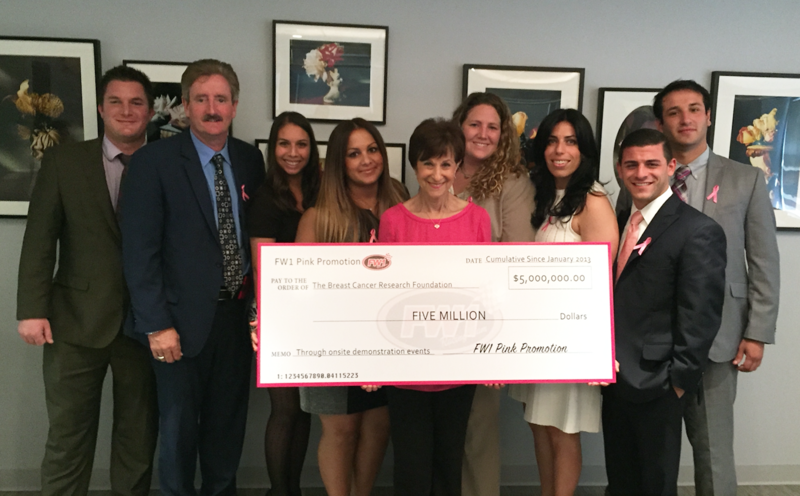 The Breast Cancer Research Foundation accepting the cumulative donations from Smart Circle. Breast cancer has likely affected every person reading this in some way and that is why Smart Circle is choosing to do something about it. The FW1 Pink Promotion program has allowed for customers and distributors to fund breast cancer research through BCRF, one of the world’s leading cancer research programs. With this substantial donation, Smart Circle is proud to stand with the BCRF group in an effort to one day find the cure. From members of the Smart Circle Sales Network that are a part of the FW1 Pink Promotion, to the corporate team at Smart Circle to the customers who purchased the products, everyone involved should walk a little taller knowing they helped in this great cause.